One thing you obviously have to think about when you move half a world away is how it will influence your relationships back home. You are moving to a faraway land, leaving behind friends and family. You get to bring only your memories and a few chosen belongings. 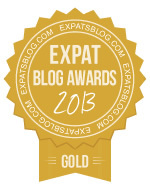 I was lucky enough to have read an expat in the ME's blog before moving here. His advice was to forego furniture and appliances if necessary to make room for mementos; Christmas decorations, pictures, favorite books, cd's and dvd's, toys, blankets, artwork. Whatever makes your house a home and will remind you of home. Thank goodness I read his blog. Our most cherished Canadian belongings are likely the Christmas decorations we first brought with us. Unlike a lot of people who change it up for Christmas every year, we have kept what we brought with us and display them every single year, every single cheesy old ornament. They remind us of snowy winter evenings by the wood stove, egg nog, family and friends around the dinner table, romantic interludes and Jack Frost. And my husband came up with the idea of getting a decoration in every city and country we visit to add to our display. To our Canadian collection we've added ornaments from Italy, England, the Maldives, Croatia, Spain, Thailand, Jordan, Ireland, Bahrain, Abu Dhabi, Dubai, Qatar, Hong Kong, Switzerland, Germany, and more. Every year, our tree becomes a greater accumulation of memories, old and new. Our tree tells of our travels, our passions, our friends and family, and - partly - of our life. To me, it is the greatest tree. It brings me close to my family and to my friends, both far and near. But despite the memories and warmth brought about by our tree, my heart still aches for my family and friends back home. I miss getting together with my girlfriends after work, just to gab and laugh, cry and gripe, eat and dance, and just plain have fun. I miss those very few girlfriends (that I can count on one hand) who I would trust with my child, my husband, my secrets, my life. I miss those people who know me from "back when", who have seen me age, who know that I'm not now what I used to be, but still today what I've always been. I miss my family more than anything. I come from a HUGE extended family. I don't see eye to eye with all of them, but I love knowing I come from such a diverse and gregarious bunch. I LOVE my siblings. I LOVE my nephews and nieces. I LOVE my parents. I have a few cousins that I would do anything for. A few of my cousins' kids are anchored solidly in my heart. I miss family gatherings, Christmas "Reveillon" (French Canadian X-mas Eve and dinner), family weddings where 4-5 generations dance and sing the night away. I miss having family close (by "close", I mean less than 24 hours away). But in the last year, I have been struck particularly hard by the distance. My mother has fallen ill, my father has fallen critically ill. They are not together, they live hours apart, separated by distance and remorse. 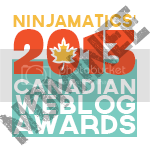 So even when I go back to Canada, it is a feat to see them and manage my time with them. They live ten hours apart. This summer, we plan to rent an RV when we go back home on vacation and drive halfway across the country to spend time with both of them. When I first learned of my father's demise, I immediately flew back to see him. My husband went online as soon as I told him and bought my daughter and I a 13-hr direct flight back to Canada. I was so happy I went. You see, he was admitted to hospital disoriented and barely able to walk. He was diagnosed with small cell lung cancer, an extremely aggressive form of cancer with a very bleak outcome. But what struck me most was not his physical state, it was his mental state. He could barely remember from one moment to the next. He could not remember being admitted to the hospital, he could not remember who had come to visit him the day previous. He could not remember all his grandchildren's names. He would get confused when looking back on his life, describing a worksite that he'd actually worked in, in a town that he'd actually worked in. But the worksite was not actually in that town. I spent my days in the hospital with him. It was summer, so my daughter and I would walk there from my sister's, enjoying the city along the way, stopping for a Tim Horton's coffee and ham sandwich (my daughter's absolute FAVORITE, even better than McDonald's she says!) and we would bring him a coffee and a bagel. I spent a few nights with him in hospital, and cried at 4 a.m. when I would see him shuffle out of bed to the bathroom in a hospital gown and back to the sink to wash his hands. I was struck by the irony of how one could earn millions in a lifetime and find himself in hospital gown in a room shared by four, shuffling about with nothing to show for his life but his spirit. It really made me question our motives for living in the ME (obviously mostly financial). It was nice to get the family together though. All my siblings gathered round him to bring him back to health, or at least to let him know how much he means to us. My brother, my sisters, my nieces, my nephews, all there to let him know what a blessing he's been in our lives. The one wonder was how my father's spirit remained intact. Yes, he got angry when he realized he was forgetting; he grew frustrated when he realized that he would not be going home; he blew up when clinicians told him he was actually losing his mind (they weren't quite so blunt, but he knew exactly what they meant). But for the most part, he was jolly. He wanted to talk, he wanted to remember, he wanted to tell jokes and laugh. I remember losing it when we had a family meeting with the medical team. I broke down sobbing. I couldn't control it. Why couldn't he remember? Yes, he's got cancer, but WHY CAN'T HE REMEMBER????? They finally told us he had dementia. It was a sour pill to swallow. I was prepared to see my father deteriorate physically, but I was NOT prepared to see him lose his mind. But. NOT MY CHOICE. About four days into visiting my ailing father, I got the news that my cousin's husband had committed suicide half a country away. This is not only my cousin, she is my blood sister (yes, we literally swapped blood when we were thirteen or so ... disgusting but true), my truest and oldest childhood friend, mother to my goddaughters, ... as they would say, she is my "sister from another mother". And her husband was such a true friend, a kind heart, a giving individual, a caring soul, a generous spirit. I'm not saying this because he's gone. I'm saying this because this is what he was. He was a true good soul. And he was gone. In a flash. So, pack away the grief for my father. Get preps underway for a 12-hour train ride across the country to attend a funeral that should not have been. Questions, questions, no answers. I e-mailed my husband, who had stayed behind in the ME. He e-mailed me back the next morning. E-mailed me his flight #. He was coming to support me. He would take care of our daughter and visit with my dad while I went to pay my last respects. It was the longest train ride of my life. Unfathomable. I should not be making this trip. My family, my friend. Why would he do this? How could he do this? Bless his soul. How???? Why???? What could we have done? When I arrived I was greeted by STRENGTH. STRENGTH in the face of ADVERSITY. In its purest form. My cousin, her teenage daughters; they were STRONG. Unbelievably STRONG. They withstood a crowd of mourners never seen in this small town. A crowd so large it filled the funeral parlor, with a lineup overflowing out into the street. People stood for hours waiting to pay their respects. Some cried, some wailed, some were silent, some collapsed. But my cousin and her daughters: they stood STOIC. And me? I stood numb. I wondered at the price I'd payed for leaving. Could I have made a difference? Probably not. Was I making a difference by being there today? Probably not. But what hit me was that I'd not been there, I wasn't there, and I wouldn't be there. I was gone. I was far, far away. In the ME. It is a cruel awakening to realize that all that you knew, all that you were, all that you loved ... will pass. I am not naive enough to think that I could stave off illness and dying by my sheer presence. But I was all of a sudden made acutely aware of the powerlessness that comes with being so far away. The time difference that makes it hard to get in touch with those you love. The distance that makes it virtually impossible to get home with less than two days' notice. The knowledge that the people you have left behind, those who are left behind, have to physically and mentally deal day in and day out with tragedy that you experience only in your heart and over the fibre optics that occasionally let you into their lives. From afar, I see my sisters struggling every single moment of every single day to make things right for my parents. They deal with our extended family's criticism, delays in the healthcare system, anger from our parents (directed at them because they are the only ones that anger can be directed at safely), and personal frustration on a daily basis. They are angels in my eyes, and I feel such guilt at being so far away. They make sure our parents are ok, getting the best care possible, as happy as they can be given the circumstances. And I am here, powerless. In reality, I'd be quite powerless back home as well, but at least I could share the brunt of the burden with my sisters. They will never know how much their efforts, their presence with my parents, their devotion has meant to me. They know I love them, they know I think of them, but they don't know how much I appreciate them. And I am here, miles away, far from all the heartache. But my heart aches. Yet realistically, I get off easy. When I call, my parents are ecstatic, they are so happy to hear from their youngest. I don't get the blame for the treatment they are getting in hospital. My sisters get shouted at and blamed for the agony of my parents. I am far away. That is the long and the short of it. Far away from Canada. And my family is far away. Far from the ME. I try to reason it, tell myself that I am bound here by my job, my family (husband and daughter), bound here by my commitment. But I am always torn. I constantly ask myself, "do I go now, do I go when they are more ill, do I go when they die?" It sounds callous, but it is the reality of living in the ME, at a minimum 24 hours away from the ones you love. You are far away when you move here. If you are contemplating a move to the ME, remember that. Can you handle it? Can you handle knowing that family members, family that you've cared for, lived with, loved, are so far away? That you cannot always reach them? That you cannot always reach those who care for them? That you may be completely isolated from them when you know they are close to death, sad, lonely, pining for you? That's the reality. This is what WILL happen if you move here. Someone you love will become ill. Someone you love will die. Someone you love will move on. Someone you love will wonder why you are not there anymore. Someone you love will be caring for someone you love, alone. Someone you love will be angry at you for not being there. Someone you love will be gone when you go back. That's the reality. You can't change it. Accept it or don't come to the ME. When you come here, you are far from home. And home is far from the ME. 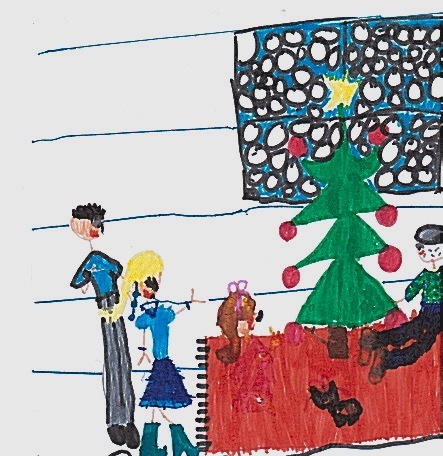 Our daughter's depiction of our Christmas tree, with my father sitting healthy in his plaid shirt on the right, our new kitten sitting below the tree, and her, me, and my husband on the left. 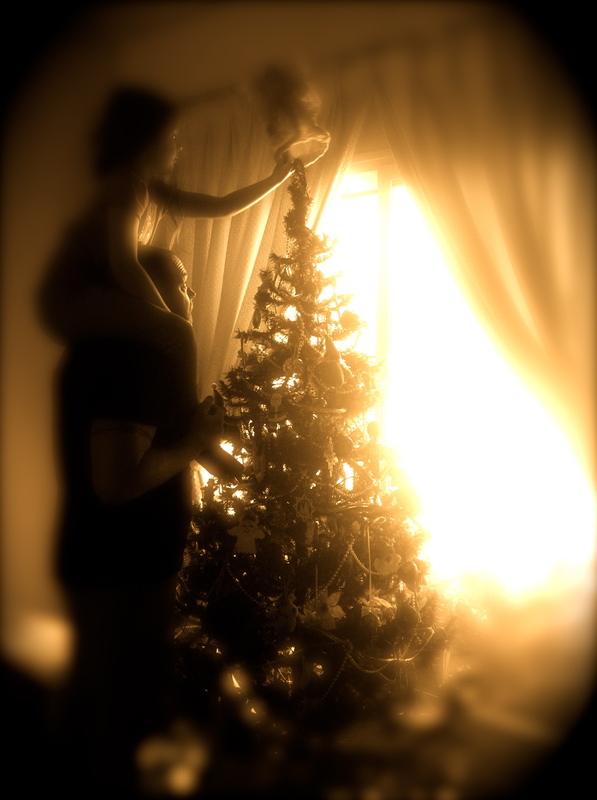 Husband and daughter placing the angel on our Christmas tree. Memories then and now.